Why do traffic reports regarding the Eisenhower, always reference “from Thorndale” when referring to traffic heading eastbound to the city? 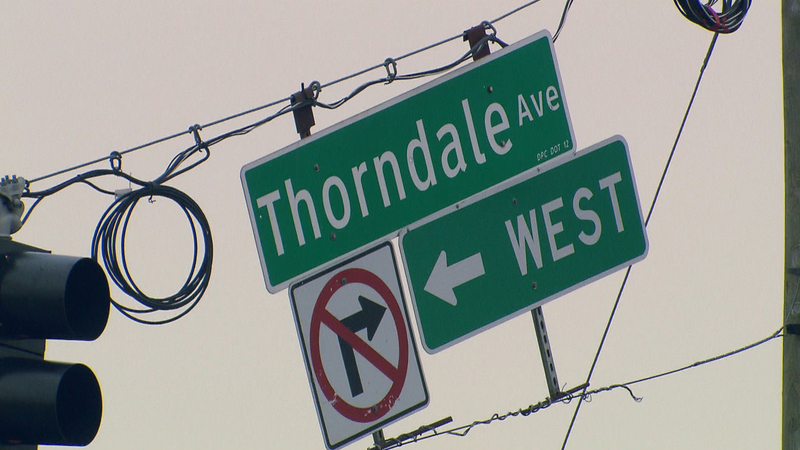 I don’t think most people even know where Thorndale is, since it doesn’t cross 290 and doesn’t have an exit. Thorndale is the reference point because it was the farthest away from the city that traffic sensors were installed in the late 1960s and early 1970s, or as an IDOT representative called it, “the end of the sidewalk.” Traffic sensors count the number of cars that pass over them as a way to measure traffic. According to IDOT, Chicago was an early adopter of this technology. To really get the inside scoop on this, we visited traffic reporters in Chicago at Total Traffic and Weather Network. Reporters there told us they sometimes reference Elgin-O’Hare, also known as Route 390, but others stick with Thorndale because it’s what their listeners and online users are accustomed to after all these years. One interesting thing we learned is that Total Traffic serves not just the Chicago area, but also provides traffic reporting for other Midwest markets like St. Louis, Kansas City and Minneapolis from their Chicago offices. In the operations center, analysts compile and interpret data from a number of sources – the sensors we mentioned, plus data from cellphone companies, traffic reporters in aircraft, traffic tip lines and hundreds of traffic cameras, including ones on billboards. That information is then disseminated to navigation software in your car, traffic billboards, mobile apps, and yes, reporters like Bart Shore and Bonnie Greene, who deliver those rapid-fire traffic reports we hear on the radio. Total Traffic says that Chicago is one of very few cities in the country that uses travel times to relay traffic information, like “20 minutes from O’Hare to the circle interchange.” In other markets, traffic reports just relay information about traffic incidents, construction or general delays. And that word salad we hear on the radio is another reason that traffic reporters stick with Thorndale – the information is coming so fast that most people only really listen for the roads they’re interested in, and if you mess with the landmarks or the order in which highways are listed, the listeners will miss the one they want to hear. Edith Rockefeller McCormick moved from her great mansion on Lake Shore Drive into the Drake Hotel when the stock market crashed. Did she live in one of the suites? Edith Rockefeller McCormick did in fact live in a four-room suite at the Drake for a short period of time before her death in 1932. The society queen and philanthropist was the daughter of Standard Oil co-founder John D. Rockefeller, and wife of farm machine scion Harold McCormick. She also had what a friend described as “ga-ga ideas.” For one, she believed herself to be the reincarnation of King Tut’s child bride. Edith and Harold McCormick lived in a Romanesque Revival mansion at 1000 N. Lake Shore Drive originally built in the 1880s and designed by architect Solon S. Beman. Among the McCormicks’ neighbors were Potter and Bertha Palmer, who created Chicago’s “Gold Coast” when they began building their castle across Lake Shore Drive from Oak Street Beach in 1882 and other wealthy families started building mansions nearby to join them, many from Prairie Avenue on the South Side. The McCormicks hosted opulent parties in their 41-room home, which was lavishly appointed with Louis XV furniture, a gilt dinner service owned by Napoleon Bonaparte’s sister and a Persian rug supposedly owned by Peter the Great. But all that wealth apparently couldn’t buy happiness for Edith. She left her family in 1913 to study with pioneering psychoanalyst Carl Jung in Switzerland, while also delving into occult studies. While she was there, she visited European zoos where the animals were kept in enclosures without bars and she was inspired to bring the concept back to Chicago. She donated 83 acres to create what became Brookfield Zoo in 1919. In 1921, the McCormicks went through a messy divorce. Harold remarried, but Edith continued to live in the mansion. She used some of her wealth to develop a lakefront community for the ultra-wealthy in Wisconsin called Edithton Beach. But the Great Depression derailed that plan and decimated Edith’s fortune. In 1932 she moved to a four-room suite at the Drake Hotel partly to economize, but also because she felt that she should live as simply as possible in a time when so many people were in need. She died of cancer at age 60 a few months after moving into the Drake after trying in vain to cure herself through psychology. The McCormick mansion sat vacant for more than two decades until it was demolished in 1955 and replaced with an apartment tower, which funnily enough has a place in WTTW history: WTTW’s broadcast antenna was on the top of this building from 1964 until it was moved to the Sears Tower 10 years later. Watch a video of the mansion’s demolition below. Note: This story first aired on Chicago Tonight on Dec. 27, 2017.